One day is barely enough to do a drive through. Two or three days would be better. Highway 101 is the main thoroughfare of the park. We turned off highway 101 to get on Bald Hills Road to reach our first stop – Lady Bird Johnson Grove, which was built for the dedication ceremony of the park in 1968. This shady, flat one and half mile loop took us through old growth redwood forest and Douglas-fir, and a great first introduction to a redwood grove. When I looked up at the redwood tree, it was amazing how straight they were. It was like looking straight up a 30 story building and I felt dizzy just looking straight up. They were noticeably taller than the sequoias we looked at a week ago and they had fuller leafs. Ferns covered the forest floor, thriving on the moisture and constant dew from the 1,200 feet of elevation. The walk through many tall redwoods, thick canopy and shade, and bright green ferns was very peaceful, especially since there were very few people even on this popular trail. Redwoods are the tallest tree in the world that often reaches more than 340 feet. In comparison, the Statue of Liberty is only 240 feet so it can be 40% taller than the Statue of Liberty. Where the sequoias are fat, the redwoods are skinnier but taller. 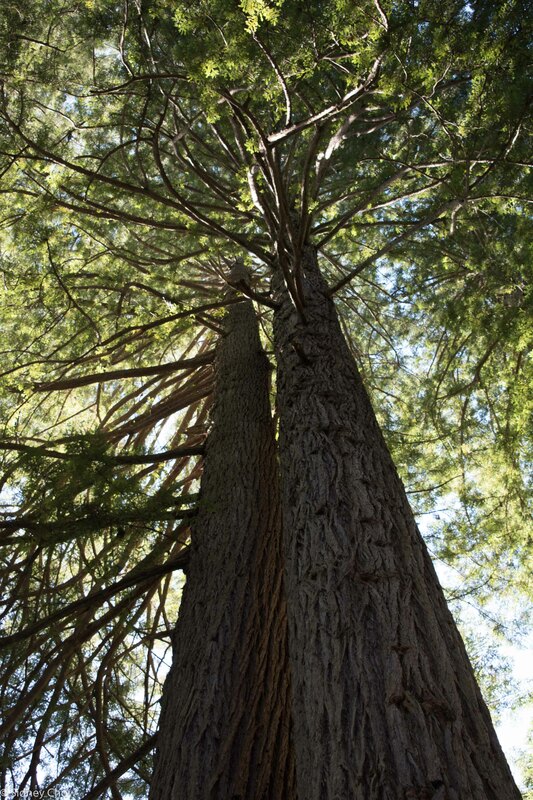 Sequoia is the largest tree by volume but redwood is the tallest. Can you really tell the difference? Yes, since we saw both the sequoia and the redwood within a week, we could see and feel the difference. Even thought redwoods are skinnier, it’s still a big tree. The diameter of the base is often over 20 feet. Since this is a park about the redwood tree, the tallest in the world, there must be an official tallest tree we can visit, right? Wrong. The Hyperion Tree, 390 feet tall, was considered to be the tallest tree in the world until recently. Now, there is some debate on this topic. No sign marks the Hyperion Tree, no trails lead to it and the location was a closely guarded secret to prevent damage by excessive foot traffic – until 2017 when a trio of articles in the local papers detailed the location. Redwoods thrive in specific climate that is available in only a couple of hundred miles along the northern California coast. 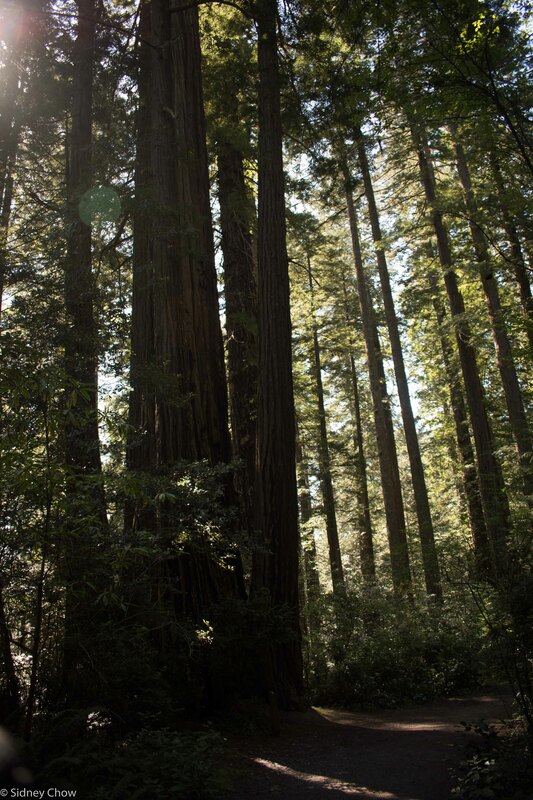 The longitude, altitude, and moisture pattern are all critical for redwoods to grow. They can get as old as 2,000 years. Further down Bald Hills Road was Redwood Creek Overlook, where on a clear day (which ours wasn’t), you can see the Pacific ocean. 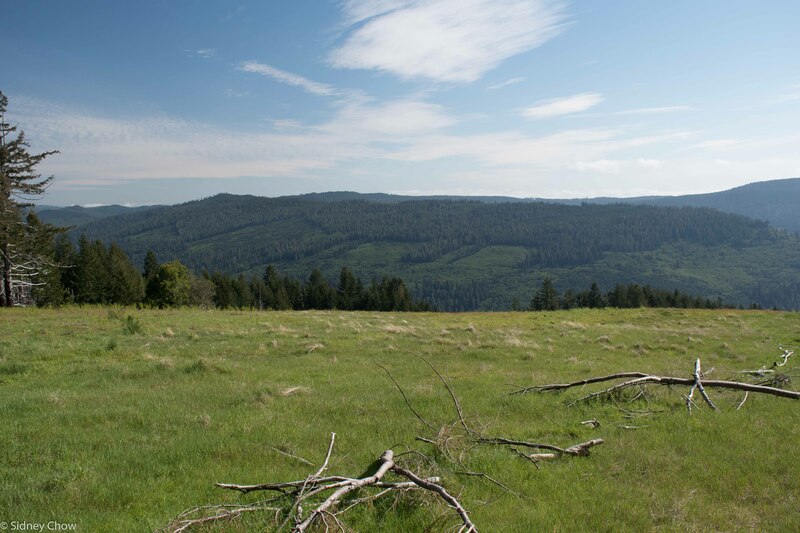 We saw evidence of clear cutting of redwoods just outside of the park boundary on the opposite hill, where there was a lighter shade of green as meadows started to grow. The amazing redwood propagate in two ways. First, the seeds in the olive sized pine cones get distributed and germinate. The pine cones can stay on the tree for up to 20 years, waiting for just the right time to fall, like after a fire that clears the underbrush. Second, a new shoot to comes up through the roots sharing the same root system as the parent tree, which helps it get the moisture and nutrients. This type of growth looks like a main trunk (or sometimes a dead one) surrounded by several smaller trunks. Again, the new shoots come up after a fire, when it has the best chance to thrive with more light. Somehow the fire releases some chemical to get the new shoots growing. Our next stop was Dolason Prairie, trail head to Dolason Prairie Trail and Tall Trees Trail. 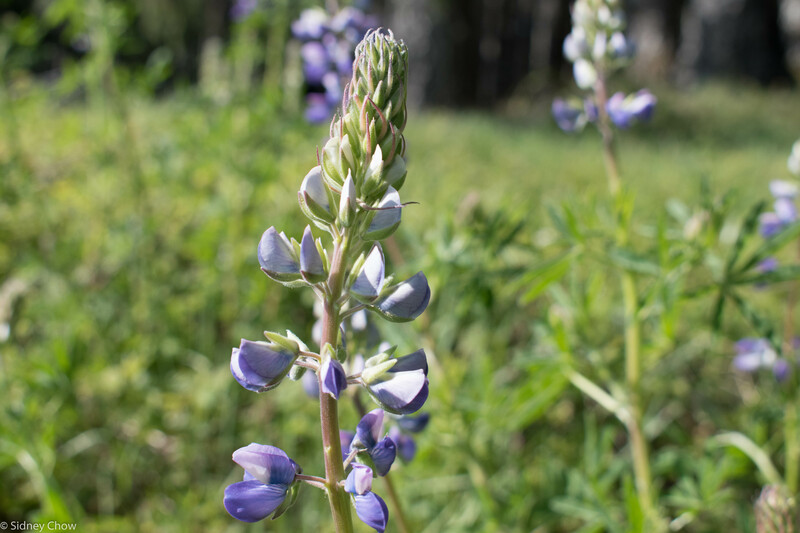 While we didn’t have enough time to hike the trails because it was too late in the day, the meadow was very pretty with lots of wildflowers and grass swaying with the wind. The name Elk Meadow intrigued me so we stopped to see what was there. I love wildlife, especially animals bigger than a cat so I was very excited to see a couple of herds of elks, all 34 of them, grazing in a big meadow. 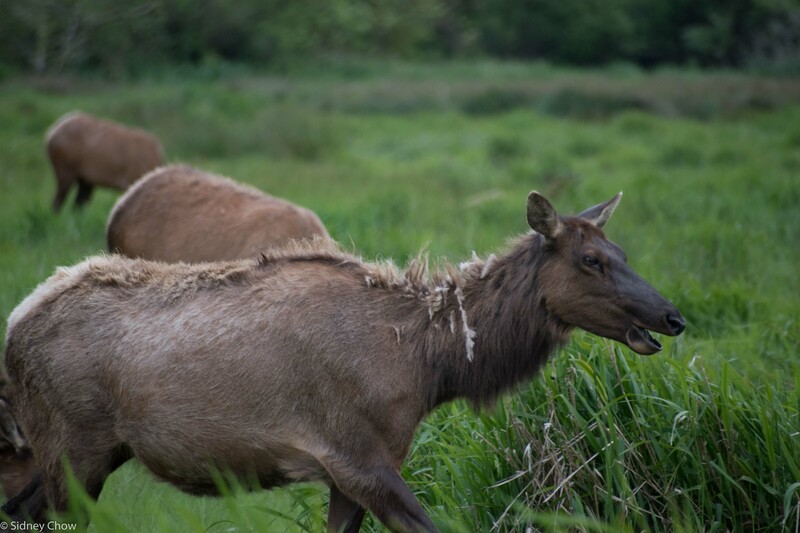 The elks looked up at us occasionally to see what was up, but mostly just grazed or laid down in the tall grass. A ranger told us later they eat as quickly as they can, up to 18 pounds of grass, and then lay down while the grass digested in the four stomachs it has. By laying down, they hide in the tall grass to avoid predators. I bought my fancy DSLR camera for exactly this kind of photo so I quickly took out the telephoto lens and the tripod. since this is the kind of situation tripods and telephoto lens were designed for. I set it all up and snapped picture after picture, video after videos. The early evening light was perfect for these shots. This was my first real chance to play with the new toy I got since it actually required the use of both a tripod and telephoto lens. I don’t know why I was so excited since these were just normal elks and there are plenty of elk pictures on the internet. There was just something about taking my own pictures to document the sighting. It’s just the excitement of getting my own shot of a large wild animal in its natural habitat.